Is it Workaholism if You Love What You Do? 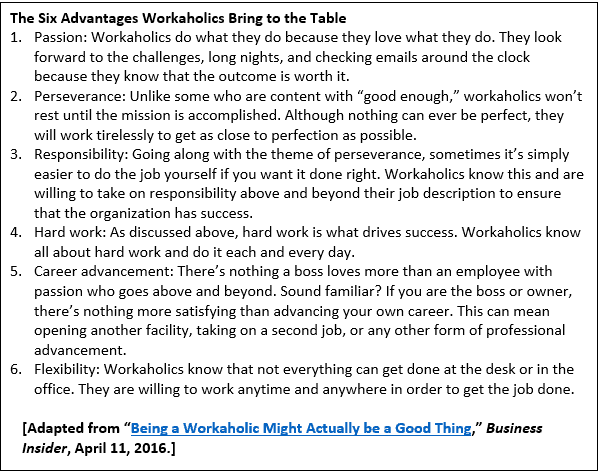 Urgent message: While the term “workaholic” has traditionally carried the stigma of addiction and resulting health concerns, new evidence suggests immersing yourself in work isn’t necessary a bad thing, if it’s something you love. Picture the workaholic in your life. We all know one. What comes to mind? Probably someone staying a few hours late at the office every day “just to wrap up a few things,” or maybe it’s the person who can’t stop checking their email on vacation. Regardless, being a workaholic is generally considered to be a bad thing for both your mental and physical health. Many urgent care owners fall into the category of being a “workaholic” due to the nature of a 7-day, on-demand retail business that requires staff be present at all times. Since roughly half of urgent care centers are physician-owned businesses, owners are placed into an owner-operator role that requires extreme commitment. Although this can be an extremely taxing endeavor, it can also be one of life’s most rewarding. Fortunately, new studies are pointing to reasons why workaholism might not be such a bad thing after all. In fact, it may even improve your health. When it comes to being a workaholic, most people assume that negative effects on your health are just part of the deal. On the contrary, a new study (among others) called Beyond Nine to Five: Is Working to Excess Bad for Health? suggests that more goes into it. It examined the health of over 750 employees to determine the effects of being a workaholic. The researchers found that even among employees who worked extra, the impact on health was not consistent. Further investigation revealed that workaholics who were able to “recharge” and step away from work at night were ultimately healthier. Those who didn’t, and those who were unable to stop thinking about work, suffered from poorer health. Secondary findings also concluded that workaholics who were engaged with and found fulfillment in their jobs were happier than their counterparts who did not feel positively. Although workaholics are generally thought to be at risk for heart disease, high blood pressure, and more due to high levels of prolonged stress, this isn’t always the case. In fact, those who can step back at the end of the day, even a long day, and those who are happy with their job can more easily fend off disease, and have more energy and more happiness. Is Being a Workaholic Necessary for Urgent Care Owners? While being a workaholic isn’t mandatory when running an urgent care center, the traits that many workaholics possess certainly are. For physicians that transition into owning their own center, or anyone running a business, there is a point where growth and success can only occur through hard work. No matter how talented your team of employees or managers is, talent and skill only take you so far. For success to occur, hard work is a key ingredient. If you push aside the negative connotations that workaholics have, you will see that they are very hard-working individuals. This hard work and dedication is what helps a company achieve success in both the short and long term. For urgent care owner-operators, being a workaholic might not be a choice. The time demands of growing your own business are steep, and hard work is the only way to meet them. Pairing talent for running the business with hard work makes you twice as productive and ultimately raises your level of success. Is Being a Workaholic Necessarily a Bad Thing? If you’re reading this article, you’re probably the person that fits the mold of being a workaholic. If so, that’s ok! Keep doing you. For urgent care owners, the stress and commitment needed to both own and run the facility can be enormous. Turning into a workaholic may be the only way to get everything done. Fortunately, that doesn’t mean you have to sacrifice your health or your sanity. In fact, you may be happier and healthier than others who are less driven. At the end of the day, being a workaholic isn’t such a bad thing as it seems. In reality, it makes for a better professional individual and ultimately helps the organization achieve greater success.